Progressive Ring Stacker - Giveaway!! I first came across Shane and Carrie's Etsy site and really liked the look of their products. They ticked all the boxes. Their items are handmade, non-toxic and developmentally appropriate. Most importantly Carrie is Montessori trained. Not only does she know the products she also knows the theory behind them. I liked them so much I placed an order and Otis has used almost every one of their items since. I have already ordered this Progressive Ring Stacker and it will soon be wrapped and waiting for Otis on Christmas morning. For us, it all began with the Bell Rattle which was his first toy at nine weeks. He still uses it today, same with the Interlocking Discs shown by Otis on video here. He is still using the Bell Cylinder and Ball Cylinder to reach (and hopefully soon) crawl towards. I personally think the Ball Cylinder is one of the best looking toys and I love having it on our shelves. Seriously, how good do these toys look? Also don't forget about the Primary Colours Mobile. All of Beginning Montessori products (as with most sold by Montessori trained sellers) come with an information card, giving you ideas on how and when to use the product with your child. I have become so passionate about good toys and these come with the highest recommendation from me. For our family they have become heirlooms and once Otis has finished with them, they will be packed away carefully for my Grandchildren. I asked Carrie to tell us a little about herself. My Montessori story begins before I was born, as my parents became interested in the philosophy and education for my older brother and sister. My parents helped establish a Montessori preschool and elementary program and I was fortunate to attend Montessori schools until 12 years of age. This has been such a strong foundation for my life. In university as I searched for my "cosmic task" I became drawn to working with young children. I had worked for many years with children and decided that I especially love how children from 3-5 discover and enjoy their world. After I completed my Bachelor's degree I did my Casa de Bambini training in 2005. In 2008 I purchased the preschool I was teaching at. Each day spent with the children brings so much joy as they discover their world and gain self-confidence in mastering a new task or come to a greater understanding. Watching children take delight in matching the colour tablets, pride in forming words with the moveable alphabet, or satisfaction in discovering a new way to clean a dish are all part of what makes my days so wonderful. I continue to be amazed that children self-direct themselves with these tasks and are able to complete them independently. I truly feel I have found my calling in life. In the summer of 2009 I started the Assistants to Infancy training. The knowledge I gained became life changing for me in terms of how I view infants and their possibilities. Each time we speak to an infant, do something to or for an infant, and prepare an environment for an infant, we are making a direct impact on their personality development, cognitive development, and physical development. What an opportunity to touch someone so deeply when they are in such a beautiful and important time in their life. What a huge responsibility! I continued with the course in the summer of 2010 and due to the intensity of the course was spending very little time with my husband Shane. So Shane decided to keep himself busy and discovered a new hobby: woodwork. After a visit to my training centre he decided that he would be able to make many of the materials. I was very delighted as now I would be able to help others provide developmentally appropriate and beautiful materials for their children. 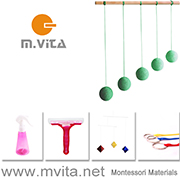 Beginning Montessori Materials was soon launched! 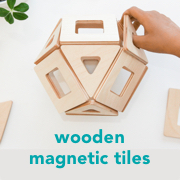 We both enjoyed the many hours developing the design of the materials with quality, safety, adherence to Montessori standards, and children's enjoyment in mind. We wanted the materials to be affordable so that more people will be able to offer their children these wonderful toys. We are a small, home-based business so while we may expand our product line in the future, we are both conscious that we have other full time jobs. Shane is a Chartered Accountant, specializing in tax and I run the Montessori preschool while completing the final work for my training. We are also working towards expanding the school to include a program for children under age 3 and their caregivers. When not working, we enjoy spending time with our two dogs in our beautiful home of Greater Vancouver, spending time with our 6 (and soon to be 7) nieces and nephews, and traveling whenever we have the opportunity to do so. The product for our giveaway is the Progressive Ring Stacker. We designed this material to be affordable for parents to provide in the home as it actually incorporates 4 different Montessori materials. When your child is 10-11 months you can offer one ring from the first stage, which is a set of round rings with a wide centre hole. Once your child gets the concept you can introduce the second ring and we recommend that you provide a small basket for the rings. This will help your child gain a sense of order and an understanding of placing toys away in a particular spot. The second stage is a set of rings that is narrower and flat that will help your child develop their hand to grasp in various ways, wrist rotation, and hand-eye coordination. You can place the base and the basket of rings onto a tray. If your child is walking then he/she can carry the tray to their workplace of a small table or the floor. The third stage is a set of metal gradation rings that will aid your child in absorbing size gradation without having to create it as the rings will always fall into a gradation. The fourth stage is set of coloured, wooden discs. This can also be ordered in oiled discs to be more natural. This is similar to a traditional ring stacker but with three discs, the younger child can accomplish the goal using the smaller material and lesser amount of discs. This is a wonderful material that will build your child’s independence and self-esteem as they master each stage. This material will last well into the toddler years. We hope your child greatly enjoys using the ring stacker in each of the four stages and that you enjoy your child at each stage of their development. Thank you Shane and Carrie from Beginning Montessori for this giveaway. To enter simply leave a comment. I will draw the giveaway using random number generator and will contact the recipient shortly after by email. Comments close Thursday 15th December at 9pm AEDT. The giveaway is open internationally but please only one entry per family. Edited December 15. Congratulations to Heather H who will be receiving this lovely Progressive Ring Stacker. Thank you to everyone who participated. This was the last of the Christmas 2011 Giveaways.